Oriflame is all about being beautiful and being the women you want to be. That is the theme of the latest Oriflame Catalogue. In this catalogue Oriflame has introduced a new perfume for women Luminescence. Before going into a party apply this beautiful perfume and when you enter the room you will see that it will be intoxicating for most people and the atmosphere will be charged with your energy. You will shine with an amazing brightness from the confidence this amazing perfume gives you. Watch the Oriflame Catalogue for March 2019 in this Video. Make if full screen and pause the video as required to check the offers in detail. You can also try this perfume by rubbing your wrist on the circle on the catalogue page. You can get this beautiful perfume at a good discount. As it is a new launch you can get 1000 rupees off on this perfume. Oriflame has some of the best perfumes for women. If you want to give a gift to someone you love then this is a good gift. I think Men should give this gift to dear beloved on their birthday or anniversary? In March catalogue, you can see some new shades in TheOne long wear nail polish. It has some vibrant shades and comes with a pigment freeze technology. This nail polish is fade resistant. College girls will really love this and working women also like it a lot. You can turn on the drama with this nailwear. As you might be aware that 8 March is always celebrated as Women's Day so we have a very special message from our Managing Director Federick Widell on this occasion for all Oriflame consultants in India. Oriflame has been creating opportunities since more than 50 years for women. Many women in India have taken this Oriflame business opportunity and developed their business as a women entrepreneurs. Next we have Love nature face mask, face scrub, etc inside the love nature fruits facial kit. This is a good bye for this month. This is an amazing deal for all Oriflame customers in the month of March. All the customers who spend 650 Rupees in this catalogue can get the love Nature Facial kit at 40% discount. I believe this is a amazing offer for all Consultants and customers of Oriflame. You should use this offer to have a facial kit at home so that you can do your facial at home itself. Many Oriflame consultants in Mumbai, Delhi, Bangalore, Kolkata, Ludhiana and Nagpur have their own beauty parlor. So when they do facials for their customers they are using Oriflame facial kits. The youth of India is fearless and fashionable. TheOne brand of Oriflame is becoming more and more popular among the youth of India. Indian woman now knows how to flaunt their beauty take care of their gorgeous skin by using quality beauty products from top beauty brands like Oriflame. In this month of March Oriflame brings you the Royal Velvet firming day cream with SPF 15. This is a anti aging cream for all women who are above the age of 40. If you have oily skin, normal skin, combination skin or dry skin, you can use this product because it is suitable for all skin types. You can get it at a discount of rupees 500. The beauty of the Oriflame hard copy Catalogue is that there are perfumes which you can try. Another such great opportunity is to try the Sensual Jasmine perfume from Oriflame. It is a floral perfume which I think every woman will love to wear. So show the catalogue to all your customers and let them try the fragrance. Your customers and can get a discount on this product and if you get 10 orders you will complete more than 150 points and qualify for business class gifts. There is discount on Giordani Gold perfume as well as Giordani Gold cream. if you have the hard copy of the March 2019 Oriflame Catalogue you can check the fragrance of this Giordani Gold range by rubbing your wrist on the catalogue. As an Oriflame consultant, I always recommend that you should buy 20 catalogues and give it to all your customers so that they can read the entire catalogue at leisure and give you big orders. If love colour box kajal then there is a good offer in this catalogue for them. Those who buy Colourbox products including nail polish and lipsticks worth 500 or more from page 26 to 31 will get colour box Kajal for free. I think this is an exciting offer and many ladies would be just waiting for ordering this. Many college girls would be really happy to have this offer. Nowadays college going girls have a budget of at least 500 rupees or more for their beauty and makeup shopping. And this offer absolutely fits into their budget. Just check the Colorbox range it is so big there is a There are many things like foundation, nail paints, lip makeup, face makeup and so many things in offer. You can see the beautiful face of Kalki Koechlin who is the brand ambassador of Oriflame India in this catalogue. She is an inspiration from many! You can find mascaras and lipsticks of a wide variety in the current month Oriflame catalogue and there is a good offer on each of them. I know many loyal Oriflame customers wait for offers on the Optimal age revive range. These products are just so lovely that's why whenever there is an offer people buy in huge quantity. This amazing Optimals age revive range reawakens your skin youth. This range is for any women who is above 35 and the product is suitable for all skin types. Moreover there is a 15% off on this product range. How does it get better than that? Even out range you can help you discover your true radiance... What else is possible? You know, Optimal skin care products are thoroughly consumer tested so you can really trust these products and you can see the ratings the customers have given, its really amazing. Oriflame India has more than 900 products and every month some new products are added to do list. One of the most wanted product is the NovAge range. Oriflame is introducing the intelligent cleansing by NovAge in this catalogue. NovAge is powered by science and it is empowering you to be the best. It is powered by advanced skin rejuvenating technologies and uses plant stem cell extracts. You can read about how it works in this catalogue and you can buy the entire set of NovAge products. It is really amazing and worth the price. I recommend that you buy the entire set of NovAge products, that will give you the best result. You looking for Anti wrinkle products? We have the Oriflame Ecollagen range for you. It is part of the NovAge brand and it is clinically proven to reduce wrinkles by up to 33%. You can scan the QR code on the catalogue page and check out the videos about this product. This is amazing feature of the Oriflame Catalogue that any smartphone user can now scan it and see all the related videos and information about the product. You can become Oriflame consultant and save a lot of money by buying products at a discount. If you want to do that you can just fill up the form below and become Oriflame consultant today. Some people think that Oriflame is only for women but the fact is that there are some amazing products for men as well. The NovAge skin care set for men has four products. It is very easy to use and you must give one set to your husband or boyfriend. NovAge Set is clinically proven and has an anti fatigue effect on the skin. The skin in many ways including wrinkle reduction, hydration, skin flexibility, skin tone and skin smoothness. One of the very famous product of Oriflame is Diamond Cellular skin care set. I know many people wait to buy this on offer and this month there is offer on this skin care set so it is a great news for all of you ladies who love this product. How many of you feel that Wellness is very important? Inner beauty is as much important as outer beauty. Oriflame Wellness has many products to take care of a inner health. Everyone in the family should take Omega 3 which is a very good for health, heart, muscles and joints. We do not get enough of Omega 3 from our normal food so if health is important for you then you must make every family member consume this every month and ensure that your entire family enjoys good health for rest of their life. If your family's health is important you can use Swedish beauty complex which helps to improve immunity. The main benefits of this product is improved skin condition endurance and enhanced immune response. This is the best antioxidant that you can get from any source. Healthy breakfast is very important if you really want to have a healthy life. 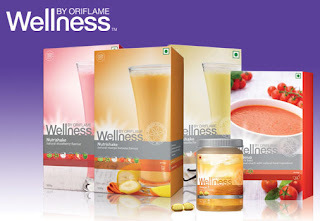 For this Oriflame has introduced Oriflame Nutrishake which gives you enough protein that you require in a day. I will say that Oriflame Nutrishake and Omega 3 is a must for every family because of multiple benefits this supplement provides. Every Oriflame consultant should buy one wellness set for their own family and only then recommend to others. There are lots and lots of products for your daily use including Hair Care personal care and body care in Oriflame March Catalogue. After a long time the Occult perfume for men is on offer. It is a classic masculine perfume to give you a fresh boost. Everybody in today's day and age uses perfume so you recommend all your friends, neighbors and colleagues who are using perfume. You can recommend them this amazing perfume from Oriflame. It is an amazing fragrance. Once they will use it they will continue to use it. This catalogue has some amazing fragrances, including love nature which comes in a beautiful bottle. Then we have the Citrus Tonic men's collection. There are many other perfume like Incognito, Glacier and Possess. There are so many personal care products. There are many products to take care of your feets and hands as well. We have the festival of Holi in March. We have amazing products on offer for those who enjoy this festival of Holi. There are amazing offers up to 40% off on Holi. You'll find hair oil from Oriflame as well as shampoos and conditioners that are on an amazing offer. I know people who buy Milk and honey soap in huge quantities because customers really love this product. It is so much in demand that many Oriflame consultants buy hundreds of milk and honey soap bars in stock. Some of the products in March catalogue are at a year low price. I am sure all Oriflame Consultant in India will enjoy shopping from Oriflame in this month of March. I wish you all a Happy Holi in advance. I hope that this month will be an amazing month for you. Those who are Oriflame customers and who want to buy in small quantity can contact me on the below number and if you have any questions you can always ask me. I will be happy to answer. If you like this post please share this post on your WhatsApp groups and please write some comment below. Your feedback will help me give you even better information in my next post.